Monday, February 4, Cedar Rapids, IA – More than 150 of Iowa’s middle schoolers presented their solutions to make city power grids that withstand and quickly recover from the impacts of a natural disaster at the Future City Iowa Regional Competition at Prairie Point Middle School on Saturday, January 26. 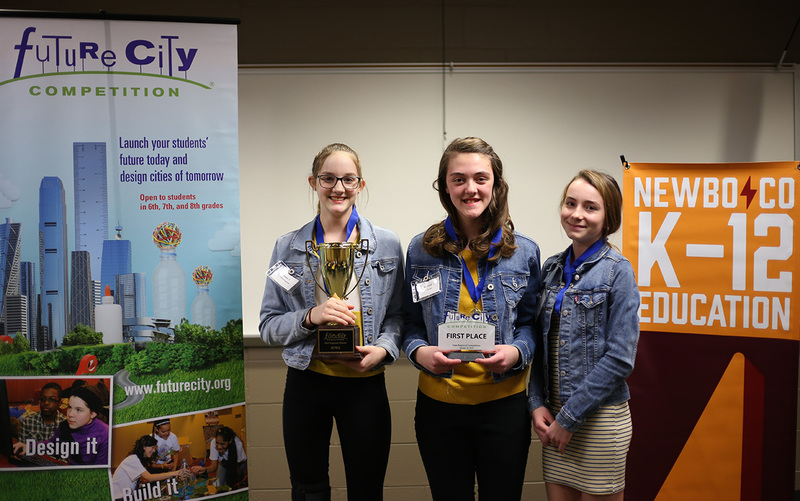 A total of 42 teams representing 16 schools and organizations from across the state registered to compete at the Future City Iowa Regional Competition. The theme of creating a city’s power grid that is resilient to natural disasters was inspired by the growing number of devastating natural disasters like Hurricane Maria that hit Puerto Rico in 2018. The Sandy Point team from Franklin Middle School won first place at the Future City Iowa Regional Competition. This winning team will receive an all-expense-paid trip to compete in the Future City Competition National Finals in Washington, D.C., in February. Jaedyn Toman, Merideth Langton, and Kathryn Zylstra will represent the Sandy Point team in D.C. accompanied by their teacher, Franklin Middle School Pact Coordinator Deb Siebenga. Future City Iowa wouldn’t be possible without dozens of volunteers and the support of Cargill Incorporated, Alliant Energy Foundation, Terracon Foundation, Kum & Go Charitable Fund, Lil’ Drug Store Products, Inc. Corporate Donor-Advised Fund of the Greater Cedar Rapids Community Foundation, ITC Midwest, Linn County REC, Ahmann Companies, National Council of Examiners for Engineering and Surveying, and Collins Aerospace. NewBoCo K-12 Education programs focus on encouraging creativity, fostering entrepreneurship, helping kids learn how to code, and promoting computer science. NewBoCo is the statewide coordinator for Future City, a national, project-based STEM learning program where students in 6th, 7th, and 8th grades imagine, research, design, and build cities of the future. About Kum & Go, L.C.For nearly 60 years, Kum & Go has been dedicated to the communities it serves, sharing 10 percent of its profits with charitable causes. For four generations the family-owned convenience store chain has focused on providing exceptional service and delivering more than customers expect. Established in Hampton, Iowa, in 1959, the chain has since grown to employ nearly 5,000 associates in more than 400 stores in 11 states (Iowa, Arkansas, Colorado, Minnesota, Missouri, Montana, Nebraska, North Dakota, Oklahoma, South Dakota and Wyoming).